The proclaimed revolutionary early access platform is sparking tons of controversy! 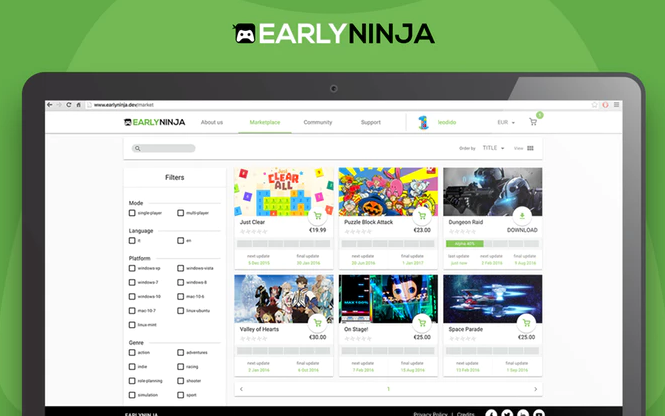 EarlyNinja is a service that just launched on Kickstarter that allows gamers to buy Early Access video games without risk and helps developers stay on track with a milestone-based system. Sounds cool right? No. This is a game developer’s worst nightmare and would be a drastic failure. Before we get into the reasons why this is a bad idea, let’s first explain what EarlyNinja is and the process in the simplest of terms. 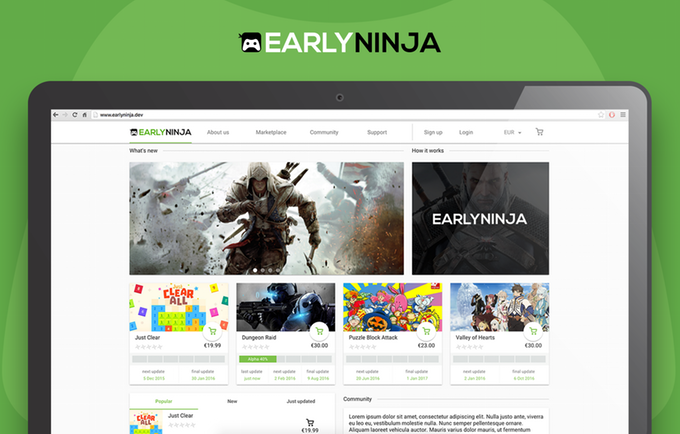 First, a developer uploads the game to the platform which would give EarlyNinja full control, then EarlyNinja verifies its quality and approves its milestones. Players then can purchase the game by paying the full amount but if something goes wrong on the development side then the players can receive partial refunds for the milestones not met. At each milestone reached, a new version of the game comes out and unlocks a percentage of the total revenue for the developer. If that was still gibberish to you then here’s another explanation. So, someone makes a game, they give it to EarlyNinja and EarlyNinja sets up milestones for the game to meet such as creating x amount of missions, players then pay EarlyNinja for the game and if the game does not meet those milestones or goals then the players can get refunded what was not met. 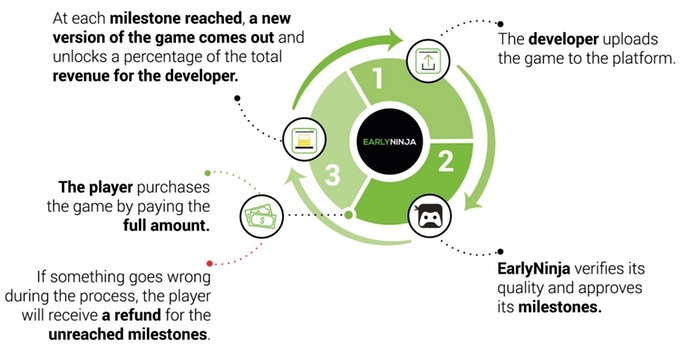 Rather than the developers pocketing the money, EarlyNinja has control over it so that consumers cannot get scammed by the developers who sell incomplete games and never accomplish the goals. They secure your investment and work with the developers to make it possible. EarlyNinja is currently seeking a $94,109 investment on their Kickstarter page and has achieved $13,940 of that goal at this moment. As they claim it to be “the Platform Revolutionizing Early Access”, it’s surprising that it has only reached that amount of their goal since its start date. Clearly, the community isn’t very fond of this solution to not that great of a problem. So, what’s wrong with this idea? Well, let’s start with their promises. EarlyNinja has created a page where you can vote on which games you would like to be on their platform, the only problem with this is that most of these games do not wish to be on this platform. Fire Hose Games, the developers of the game 20XX, tweeted the other day calling out EarlyNinja on their failed promises.
.@EarlyNinja is a scam. They promise to promote transparency, then feature 20XX on their website without permission or asking us. EarlyNinja listed 20XX on their voting list though it is clear that Fire Hose Games had no say in this and did not want to be part of it. EarlyNinja does not have the right to force developers into their platform and this is a clear example of them trying to do so. Ryan Morrison, also known as Video Game Attorney, is an attorney dedicated to legal matters within the gaming industry. He responded to EarlyNinja once it debuted calling out its flaws. A majority of Morrison’s claims and arguments against the platform have been based on the Kickstarter page as well as their website showcasing games as well as personalities who do not support the platform but are shown in the perspective that they do. And that is where the illegal aspect comes into play as copyright infringements and trademark issues are everywhere. You can hear more about those specifically in Morrison’s podcast. EarlyNinja has responded to these claims in a post which stated, “We apologize for any use of material that might have caused offense. It was not at all our intention and it was done with the aim of gathering user feedback through a simple poll. The message was unclear from our end, but the scope was of getting hints regarding which developers we should have contacted first among the thousand in the early access genre available on the market to start our screening process. To be clear: as of today, we are not selling, promoting or hosting, any of the games on our poll”. EarlyNinja uses the defense that the poll was simply for survey purposes and not as a promise to which games can be delivered, but if that is the case then that just proves this platform cannot gain content of that caliber. With big names from the YouTube gaming community being shown in their videos and quoted, it seemed like they sided with EarlyNinja. However, most of these creators and personalities were not affiliated with EarlyNinja. EarlyNinja stated that “None of these quotes and influencers are directly linked or endorse EarlyNinja and serve only as inspiration for our work, although they look like discussions that promote EarlyNinja itself”. Think about that. They used quotes from influencers that were not affiliated with them at all just to promote their platform. If that isn’t pathetic and appalling then I don’t know what is. The last issue that we are going to address is the developer's side of it all. The person that EarlyNinja seems to mark as the enemy that their ‘heroic’ platform can conquer. Mike Bithell, the developer of Thomas Was Alone and Volume released a detailed blog post in which he stated, “Holding milestone payments is one of those ideas that makes a lot of sense to a fan of games who’s never made one, and I suspect is the idea this was built around. Except it doesn’t achieve the outcomes you state. Crucially, milestone payments are front loaded, because in real game dev, the most important thing in the world (besides making something awesome) is steady cash flow. Even a month with no cash coming in can kill a team *gestures to every story about a studio shut down ever*. Milestones work pre-release and in private because there is room for both parties to work together, adjusting plans, so that a game actually comes out the other end. Publishers don’t generally use milestones as ransoms, because it’s in their best interest to get a game out at the budget planned for. Your system doesn’t encourage that, you are genuinely asking a studio to hand you the power to shut down their production immediately. And pay you 15% for the privilege”. EarlyNinja hoped to counter these posed problems stating that their “platform, while offering superior protection to consumer purchases, has always had the task of improving discoverability and promoting hard-working developers to help them emerge from the clutter of the market. We help developers by charging half of what major platforms currently charge, and with the figure of the “Sensei”, a dedicated project manager/communication consultant from our staff who regularly follows the flow of the game and its interactions with the gaming community. We are currently working on even more ways to improve discoverability for indie developers”. If anything is clear after reading all of this, this is a bad idea. The theme that I get from all of this is that the basis of the platform is built on hopes and promises that are either untrue or not guaranteed. Ranging from games promised to false quotes from influencers, this has scam written all over it. Though this could have been a great idea to bring gamers and developers closer together and ensure the players’ investments are protected, poor execution has taken over. So while EarlyNinja hopes to be the revolutionizing platform it claims to be, I don’t see that ever happening and neither does a majority of the community.